Howdy! Cody Hopkins, here. I’m thrilled to be guest blogging for the Greenhorns on behalf of Grass Roots Farmers’ Cooperative. 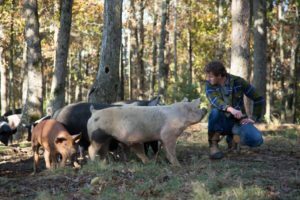 We’re a group of pasture-based livestock farmers operating under a single set of animal husbandry standards and selling our meats under the same brand. Of the many exciting endeavors our cooperative has set out to accomplish, the one I want to focus on here is our efforts to breakdown the daunting barriers to entry for beginning farmers. My wife Andrea and I are fortunate to have been farming for 11 years now. When we first founded Falling Sky Farm, we had a lot of support from friends and family. But not everyone is so lucky. And even though we had relatively easy access to leased land (a barrier that’s insurmountable to a lot of folks looking to get started in agriculture). Dealing with the lack of access to processing and cold storage services, combined with managing the complexity of operating a fast-growing small business, was extremely overwhelming. When we decided to start our own farm, we did so thinking the whole project was pretty straight forward. You raise the animals, you process the animals, you sell the meat. But any of you who have tried your hand at running a farm know there is absolutely nothing straight forward about it. We knew animal husbandry would be complicated. Andrea had experience raising chickens, and I had spent a week at Polyface. And we thought that would be the hardest part of the operation. Not by a long stretch. What we didn’t anticipate was that in addition to being farmers —which, in peak season, is a dawn til dusk commitment— we would also have to be butchers, accountants, marketing and sales professionals, and distributors. Through conversations with other farmers in our region, it became clear we all had similar struggles. This got me thinking about how we could better support each other. Many of us were already splitting a bulk load of grain, transporting chicks for each other, and sharing large customers one farm couldn’t supply on their own. But, initially, I wasn’t quite sure what shape a more formal collaboration should take. In August of 2013—while on a trip with Heifer International to visit some of their work with agricultural cooperatives in Nepalese communities—my vision came into focus. Seeing how much the farmers in Nepal benefitted from formalized cooperation, I wondered if the same could work for us. When I got back to Arkansas, I started organizing like-minded livestock farmers—many of whom I knew from farmers’ markets and others who I met through regional farming conferences. After kicking the tires on the cooperative model for six months, we formally established Grass Roots in the spring of 2014. We launched our co-op with support from Heifer USA—the domestic branch of the international nonprofit. Our mission is simple: help small-scale farmers thrive. Our ends statement, which I think is worth including here, is a bit longer than that but it essentially boils down to the goal of making sustainable agricultural viable for farmers and consumers. Our member farmers are making a livelihood. Consumers are connected to our farmers. Consumers have access to healthy, sustainably produced food. The environment is protected and improved. Our animals are raised with respect and concern for their well-being with specific concern for the animals being able to express their natural behaviors (cows graze, pigs root, and chickens scratch). Local economies are supported and expanded. By taking the bulk of the non-farming burdens off the farmer’s plate and allowing them to focus on their work on the farm. We have a staff of professionals that handles day-to-day operations—including processing, aggregation, accounting, marketing, and distribution. We buy feed and chicks in bulk, which lowers their cost. To ease a farmers cash-flow burden, the co-op makes pays upfront for the feed and chicks and simply deducts the expense from the farmers’ payout. And, most importantly, we are committed to paying our farmers a living wage. I don’t mean to imply that now that our farmers are part of a cooperative everything is smooth sailing. As I’m sure you can imagine, there are still daily on-farm challenges. And the the cooperative has its own struggles. For example, right now we are working to grow a customer base—a group of conscientious consumers willing to pay more for responsibly raised meats— that’s big enough to support our farms. But the reassuring news is that we’ve realized our vision—we, as small-scale farmers, have absolutely found strength in numbers. downeast foxfire camp registration now open!